I live near two Goodwills and one of them is really not very good. However, I was nearby when I was running errands, so I popped in. So Happy I did. I found some real treasures. All three pieces. The Carolers and the lighted tree. Perfect for my desk area. 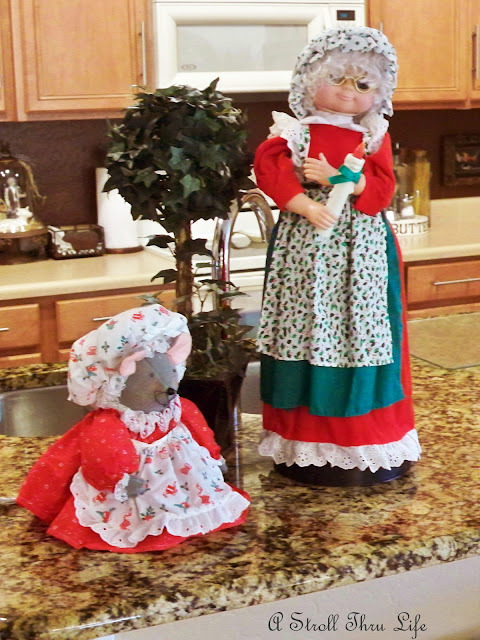 These two will reside in the kitchen when I get the rest of the decor down. Mrs. Santa has a battery and she moves her head and swings her candle. Cute, cute, cute. I just had to have this fun little mouse. 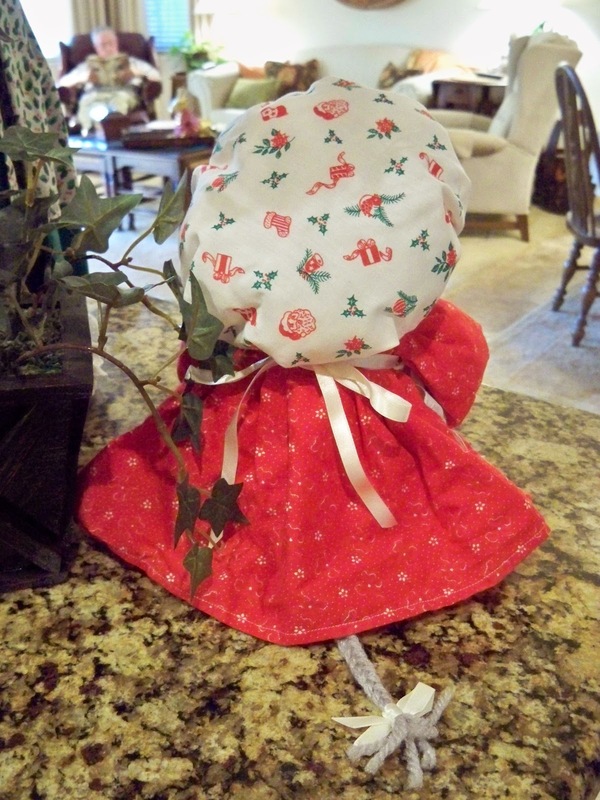 She is just adorable and her dress is so poufy, with a cute little apron and bonnet with lots of packages, holly and candy canes and stockings on them. My last treasure is the brother to the reindeer I found at the other Goodwill. Now Ta-Da, look at the total. $25.94 for all six pieces. They are all really great statement pieces and I think the price is unreal..
Those really are some great finds! Oh do I love those little carolers! You do have good GW's out by you. Great deals, I think I'll do a little thrifting this morning! Have a great Saturday! Oh my goodness, you have once again found the coolest things at GW. 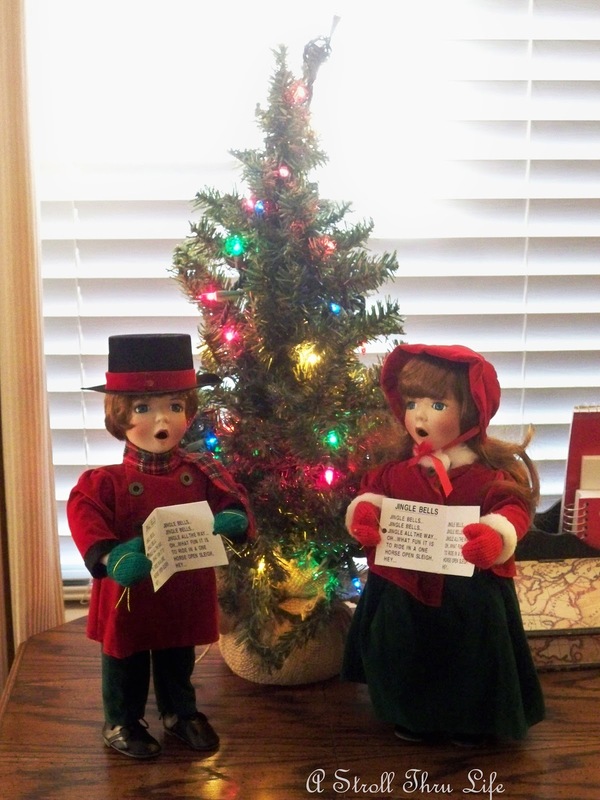 Those carolers are just the cutest -- I love the sweet faces! You know, I have the sister to your cute little mouse. Mine isn't dressed for Christmas, but wears a fluffy little red polka dot dress & lacy collar. She's been with me for 25+ years. I refer to her as my "mouse-maid," but she doesn't really do too much to help me with the cleaning. Her role is to just look cute! How cute, Marty! I love those carolers! I always stop and look at carolers wherever I am. In fact, I think Christmas Tree Shop had a nice selection. I may have to go back and check the price on those. My Goodwill will have a lot of Christmas stuff come January. I plan on purging those things I haven't used in the last few years and donating them. Great finds! The mouse is so cute! You always do so well at Goodwill. Especially love the carolers! Right up my alley lady! Love a good bargain ;) I was out thrifting yesterday and ours had pre-lite assembled trees for $15.00 and some of them were really, really nice! It took all I had not to buy one (that I don't need) LOL! Everything is already looking so festive. I guess if the hubby got the stuff down, you have to crack into right? Great finds Marty, they are perfect touches for your Christmas decor. those are some christmas cutie patooties for sure.. I found a lil santa myself at goodwill on wednesday. Oh my...now those carolers are just so darn cute...lucky day at GW:) Have fun decking your halls!! Great deals, displays and photos. I love the picture with DH in the background! Too cute! Hi Marty! Love your new Christmas banner!!! Don't you love Christmas bargains. Yours are so cute. What a steal!...or more like a Christmas gift!!!! I love everything, but especially the carolers! I would love to have something like that in my dining room. Hi Marty, I love all the great treasures you have found, I alwas say you can't go wrong with the GW. Have agreat weekend. Awesome finds at excellent prices! Those carolers are the sweetest! Great finds and a steal of a price too! The mouse is my favorite! I love her braided tail and cute outfit! What a find! but maybe I need to find one soon! 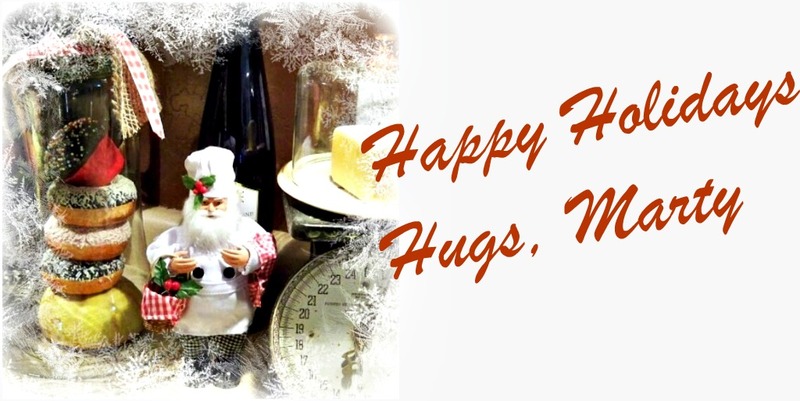 Your little holiday finds are adorable. with the braided tail. LOVE her! You got some adorable pieces!! I love the little mouse too..just so precious! I'm glad you found such great deals! Oh Marty, I went to five Goodwills today and only found one thing at each one but they were great one things!! You always seem to find the greatest things there. 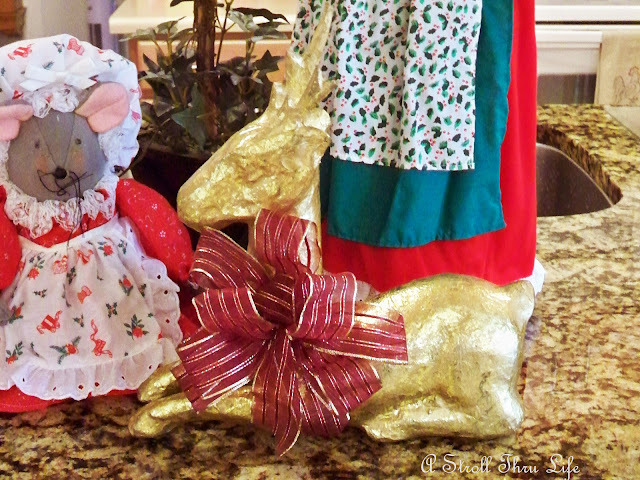 It just proves that you can make a wonderful Christmas on a small budget! Have a great day! Beautiful finds, Marty! Love the carolers! Hi Marty! Those carolers are so cute and I love Mrs. Santa. We don't have Goodwill in our area, however, we do have Salvation Army stores; but I never find great stuff like this. Lucky you! Marty, I love all your finds, but especially the carolers. You did it again....hit the jackpot! Have a good one! Once again, you are the Queen of finds from GW! 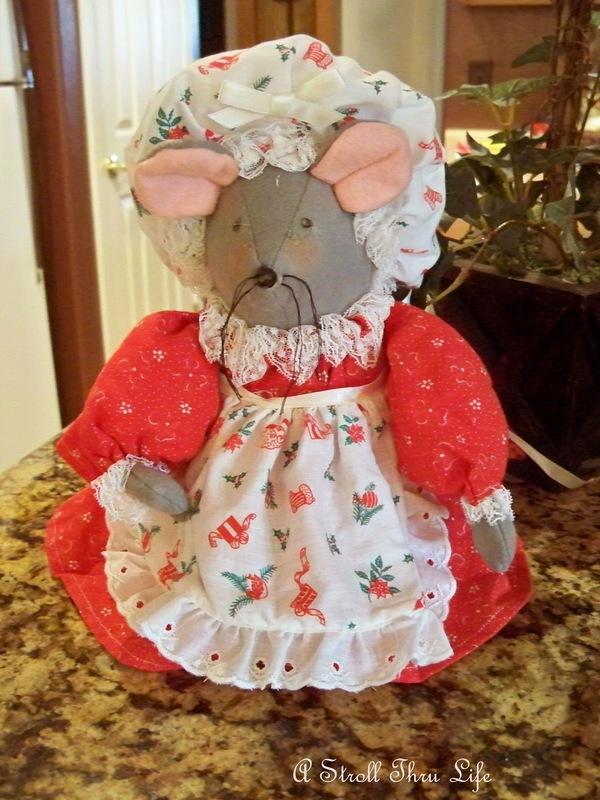 I love your new additions ... Christmas mouse is too cute, and I love the carolers! Look forward to seeing more! Marty - you are such a savvy shopper - you know the places to go and you certainly know how to pick the things to do Holiday decorating! DH is a Wise Man to stay in his chair while you are decorating, dear friend!!! I'm reading this post to "Mr. Ed"!!! Your Goodwill Managers could come to Kansas and lend our stores a helping hand! I'm thrilled at all your thrifty finds and agree they need to come live with you in your home decor @ A STroll Thru Life! Thanks for sharing!!! 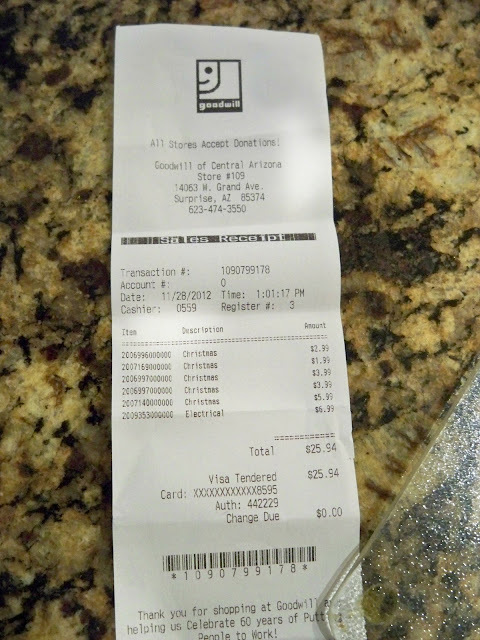 What fun finds, I have got to go to Goodwill and check it out. You did good. All of your new decorations are so pretty, but oh, how I love that mouse! Marty, All the GW finds are sooo cute! I love the darling mouse. I've been shopping at thrift stores for decorations for dad's house and I have found some great things.